We know how hard it can be to get kids to want to participate in family activities — especially when they hit those very, um, special tween/teen ages. But the truth of the matter is this: When those angsty kids reach adulthood, family nights are the times they’ll look back on and remember fondly. So how do you get your kids to not only take part in family nights, but actually look forward to them? By planning fun events that are undeniably worth doing. While we love Netflix (doesn’t everyone? ), plopping down for a binge doesn’t exactly bring on the bonding. 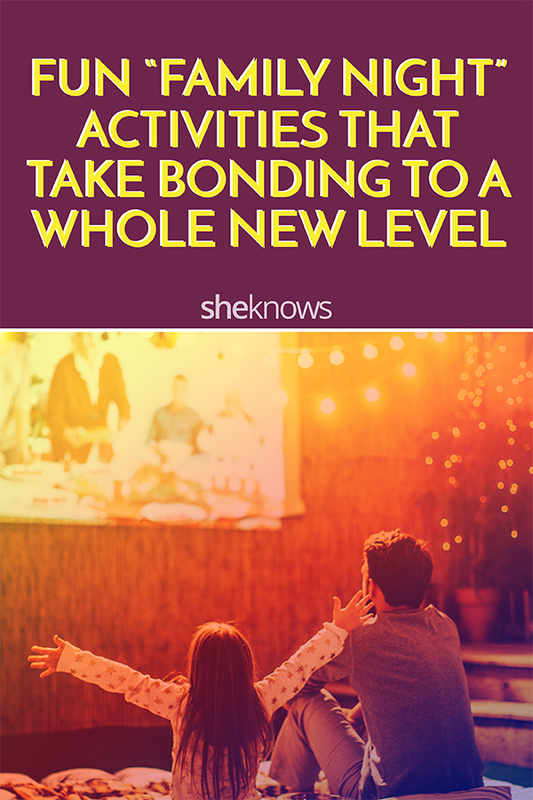 The right activities, however, can encourage your family to interact with one another more — instead of just with that screen. Yes, as we mentioned, it’s easy to cue up a movie and chill out. But it’s also (surprisingly) easy to amp up the family-movie fun factor without going overboard. Just create some tickets (index cards, y’all) and a concession stand (popcorn and candy or go healthy with veggies and dip) and set it all up on your kitchen counter or a table — oh, and have everyone pay with fake money. It’ll be a huge hit with the kids. 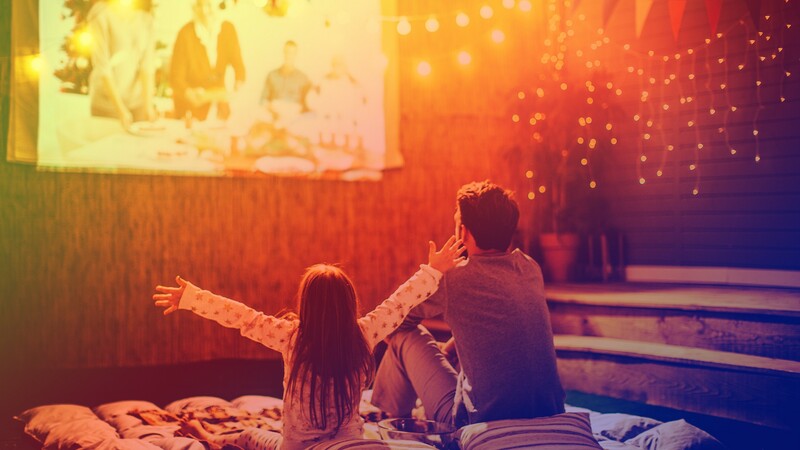 Help your kids work together to plan out a home movie (most smartphones can handle recording video, and there are even apps you can use to edit and make it into a super-cool movie, complete with music). Board games are another obvious choice, but is there really a substitute for good-natured family competition? Whether you have old board games from your own childhood on hand or have invested in the latest celeb-backed creations, clear off that table, serve snacks and battle your kids for the ultimate championship. Just don’t get overeager and try to lure them into a four-hour chess tournament, OK? Instead of playing a game you’ve played a hundred times before, grab some poster board, markers and little objects you can use as game pieces — and create your own family board game. Camping is for the hardiest of folks, right? Not necessarily, especially if you just pitch a tent in your backyard — or your living room. That way, there’s indoor plumbing available. And while a campfire sounds like good fun, it’s not always practical (in high winds or bad weather) or safe (don’t light a campfire inside your house, OK?). So instead of roasting marshmallows over an open flame, you can make s’mores inside with one of these easy recipes. Sleeping bags, lanterns, scary stories and all that togetherness will be sure to make your “campout” supreme. Sure, crafts can get messy, but it’s worth it to get elbows-deep into some art with your kids. With just a few supplies (or even a premade craft kit), there are plenty of options for you all to get your art on. Move over, meatloaf; work with your kids to carefully plan out a special dinner. Pore over family recipes or look up a new one online. Then shop for ingredients and let your kids help you prepare and serve — fancy dishes optional. Another dinner winner is setting up a taco bar with all the fixings. This way, everyone gets in on the fun and even the littlest kids can help put their tacos together. Or if you’re more of a sweet-tooth family, plan a fun team baking night. Pie? Cake? Brownies? The possibilities are endless — and delicious. Yes, more food — but nothing tops (get it?) selecting your own toppings for a pizza you’ve made yourself. Find out what your kids’ favorites are and maybe even sneak in a few ingredients they’ve never tried. This is “playing with your food” with an architectural spin. Take some fruit cubes, a bag of marshmallows and some toothpicks or slender pretzel sticks and try your hand at building with your food. Kids can create a person, a house, what have you — and when they’re done admiring their work, they can eat it. Win-win. You probably know taking the whole fam to a pro sporting event can get super-expensive. Instead, go small and stay local. Minor-league affiliates of Major League Baseball teams are super-affordable, for example, or you can check out local college or high school sporting events. Puzzles can run the gamut from super-hard to super-easy. So aim somewhere in the middle (unless you’re dealing with toddlers, of course) and set up a family puzzle with a cool image you can work on together. Bonus points if you set aside a separate table or other space where you can keep it going until the final piece is put into place. Blanket forts are a classic; they can be super-simple (drape a blanket over two chairs and voila), or they can be stunningly complex once you start adding towers and flying blanket buttresses and the like. Turn your living room into a super-fort complex, and you won’t even need to pitch a tent for that family campout we talked about. Gather construction paper, markers or crayons, puffy stickers, magazines, glue sticks — you name it — and turn a simple greeting into something crafty and cute. Mail them to far-off relatives or just your kids’ friends down the street. Mad Libs have been around for ages, but we’re convinced they never get old. They’re a great way to accomplish a few goals at once: Have fun as a family; teach your kids about nouns, verbs, adjectives, etc. ; offer the opportunity to read out loud; and laugh your butts off. Cardboard boxes offer endless opportunities. Smaller ones can become cash registers, car garages or dollhouses, and larger ones can become vehicles, stuffed animal enclosures or a playhouse. Instead of tearing down and recycling your boxes, stash them somewhere until you’ve got a good collection going and then bust them out for box night. This one’s great for the littlest kids. Ask each family member to choose an item that’s important to them and then tell all about it. Encourage your kids to make a poster or choose a song to play to further illustrate their item. Let your kids rifle through your closet (maybe hide the fancy fabrics first) and choose outfits to try on. Don’t worry; parents can get in on the fun too — although you probably can’t wear your kids’ clothes, you can pick out something you haven’t worn in five years and try it on for a final spin while you debate whether to toss it (you should probably toss it). Have every family member choose several of their favorite recipes you often share as a family and write them out or type them up for future reference. Bonus points for pretty cover pages, string binding, etc. No matter how old your kids are, chances are they would still enjoy a coloring session — especially if brand-new markers and fancy grown-up coloring books are involved. Grab coloring books (whether they’re your 5-year-old’s or your own) and go to town. A version of this article was originally published in October 2011.